At the beginning of 2019, Rick Joyner posted on MorningStar’s website telling about a dream he received during the month of December foretelling of a Second American Revolutionary/Civil War. On December 14, 2018, I had a dream about various attacks coming upon our country. I was also shown those who would be sent out to counter each one. From what I had seen as I walked to see the present, I understood why this Revolutionary/Civil War was “inevitable” and why it was “right.” As I stood pondering this, feeling that this might be the most important revelation I had ever been trusted with, I woke up. I felt that I had been given access to this history of “The American Republic” from heaven’s perspective, and that I would be going back to it for more understanding to help us prepare for what is to unfold. We are already in the first stages of “The Second American Revolutionary/Civil War.” I know this leads to many questions, such as: What are the sides? What are the issues? What is right about it? Most important of all, what does success in this war look like from heaven’s perspective? The Heritage USA Museum is located off Main Street inside the Heritage Grand Hotel. This excellent project was by Ben Martin and Clint Rogers. Donors, including Pastor Jim Bakker, have given some of their personal possessions to this unique museum. Someday they hope to have a larger facility to house everything they are collecting to showcase the entire history of the PTL Ministry. 1.) 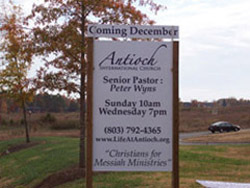 Antioch International Church, pastored by Peter Wyns, is located in the old PTL Barn Auditorium. They are located in the same building but due to the new townhouse development that was just built, they had a street name change. 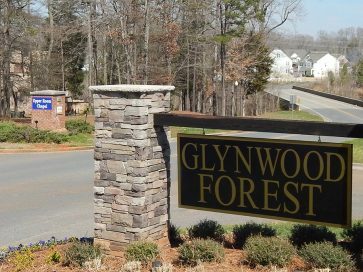 Their new address is 453 Glynwood Forest Dr. Fort Mill, SC 29715. 3.) World Outreach Center & Community Church– directed by John and Joanne Cava is located at PTL’s former Welcome Center near the old entrance to Heritage. Information about this ministry can be found on their facebook page at: https://www.facebook.com/worldoutreachcenter. 4.) The Upper Room Chapel is owned and operated by Mr. Russell James. The chapel is open Monday thru Friday from 8 a.m. to 11:30 a.m. for prayer. Worship music is provided by Alan McCain each day. It is open on Saturdays from 7 a.m. to 5 p.m., and Sundays from 1 p.m. to 5:00 p.m. There is also an 11 a.m. church service on Sunday conducted by Bishop Ron Lambright. ALL ARE WELCOME. For more information, check out their website at: at: www.upperroomchapel.com, or keep current with the happenings at the Upper Room on their facebook page at; https://www.facebook.com/groups/62147692320/. 5.) MorningStar Ministries/Heritage International Ministries “HIM”is located in the Heritage Grand Hotel. 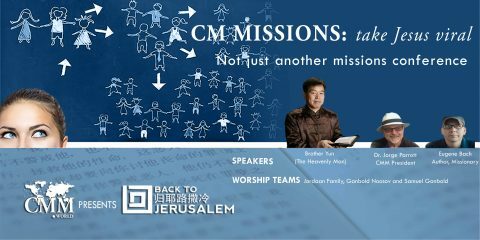 For information about this worldwide ministry, check out their website at: www.morningstarministries.org. 6.) 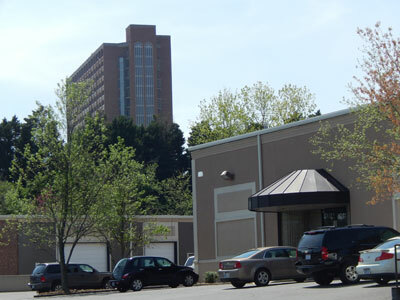 The Jubilee Life Center Church of Charlotte N.C. – pastored by Bishop Charles Gibson is currently leasing the old Wagon Wheel Restaurant for Sunday church services at 10 a.m. and a Tuesday evening Bible Study at 7 p.m. 7.) 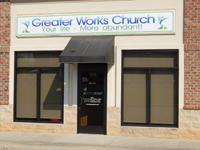 A Greater Works Church, pastored by Germaine Nichols, moved into Suite 103 in the industrial section just over the railroad tracks at 8169 Regent Parkway. This church describes itself as “a Bible-based, grace-centered place of worship that values relationship over religion. We believe that when people of God gather miraculous things can and should happen. God, through his son Jesus Christ, has given us all gifts that fulfill both our spiritual and practical needs, so that we may live a joyful and abundant life. Come experience worship with stirring music and a message that uplifts and inspires. Be a part of something great. Don’t join a church join a Greater Work! Yours by Grace, Pastor Jermaine Nichols” Meetings at ‘A Greater Works Church’ are on Tuesday evenings and Sunday mornings. Learn more about the church at: http://www.agreaterwork.com. 8.) 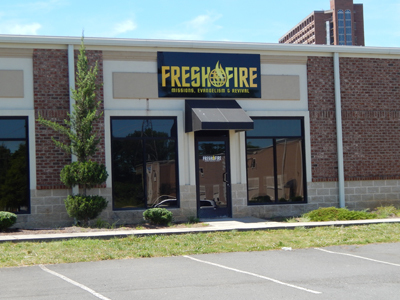 Fresh Fire Ministry headed by Todd Bentley is located at 8180 Regent Parkway. Check out Fresh Fire’s website to read updates and learn about upcoming events at: www.freshfireusa.com. 10.) Secret Place Church, pastored by Darryn Belieu, held their first service on January 17th, 2016. 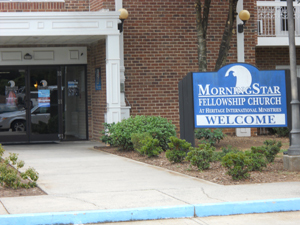 This church is located in the Fresh Fire Ministry building located at 8180 Regent Parkway, Fort Mill, S.C. Evangelist Todd Bentley is also a part of this ministry. Their service times are Wednesday at 7 p.m. and Sunday at 10:30 a.m. 11.) Kingdom Life Church, pastored by Senior Pastors Dr. Dennis and Dr. Jennifer Clark is now meeting in theWest Ballroom of the Heritage Grand Hotel on Sunday mornings at 10:00 a.m.
Morningside Ministries is building a prayer chapel at the top of a mountain on the 700+ acres of Morningside Ministries located in Blue Eye, Missouri. Pastor Jim Bakker named this mountain, Prayer Mountain. The following Jim Bakker Show describes this new building. On the 18th, ABC’s “20/20” interviewed WSOC TV Eyewitness News reporter Mark Becker for its two-hour documentary that aired Friday, January 18th called “Divinely Unfaithful,” recapping the 1987 PTL scandal of 1987. FORT MILL, S.C. – The fall of Jim and Tammy Faye Bakker and their PTL Club ministry has captivated the Charlotte region for decades. The Bakkers were the stars of “The PTL Club,” which aired on television in the 1970s and ’80s. 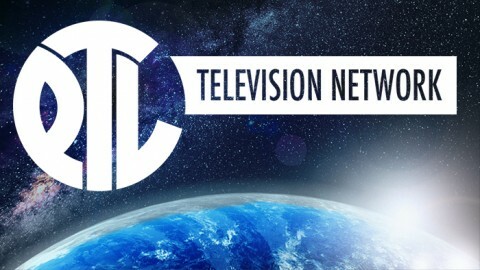 They took it from a local ministry on Park Road in Charlotte to televangelism’s national stage beamed around the world from their Heritage USA ministry in Fort Mill. The shows and their lifestyles were lavishly built with money from those who donated millions to help the PTL ministry grow. PTL singer Toni Bogart singing Lamb of God on the PTL television show. On the 1st, Life News reported: “Abortion was the leading cause of death worldwide in 2018, killing 42 million people.” More human beings died in abortions than any other cause of death in 2018, a new report indicates. On the 20th, World Israel News reported: “Iron Dome intercepts Syrian missiles following claims of attack on Damascus.” Missiles fired towards the northern Golan Heights were intercepted by the Iron Dome missile defense system on Sunday afternoon, the Israeli military said. On the 31st, the Weather Channel reported: “Polar Vortex triggering the coldest arctic outbreak in at least two decades in parts of the Midwest.” The arctic outbreak of January 2019 will go down as the coldest in parts of the upper Midwest since the 1990’s, shattering numerous daily records, and even topping a few all-time cold records, while creating wind chills as cold as the 60s below zero. On the 3rd, Russell James, owner of the Upper Room Chapel, posted the following on the Upper Room’s facebook page: https://www.facebook.com/groups/62147692320/. Last night we updated our streaming system with a new computer, new software and better sound. We are not streaming in full High Definition yet. 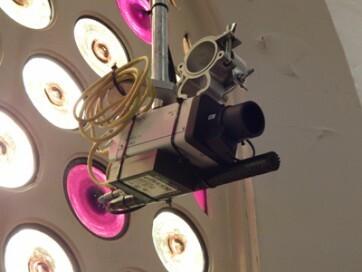 We are saving our donations to purchase a new HD camera so we can upgrade again. This new system will better provide an Upper Room experience for those who cannot be here. Please check out the new upgrade at www.upperroomchapel.com. Click on the ‘live camera’ link at the top of the page. Please tell us what you think. 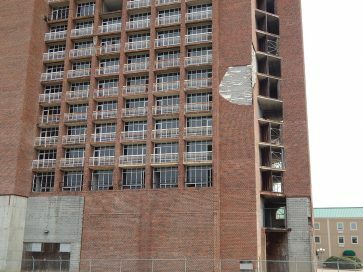 The Towers: MorningStar Ministries’ lawsuit against York County over the 21 story Towers continues. There soon should be news about a date for this trial that is to be heard by the South Carolina Supreme Court. The ultimate issue of both the Revolutionary and Civil Wars can be summed up in one word—LIBERTY. True freedom requires liberty and justice for all. We are still fighting for these, and this war will not be over until they are realized as fully as they can be on this earth. To pursue this is the calling and destiny of the American Republic. On the 25th and 26th Rick Joyner held MorningStar’s annual Prophetic Round Table at the Heritage Grand Hotel. This two-day event brought prophetic leaders from around the country to gather together to pray and prophesy what the Lord was showing them to expect in 2019. A few of the attendees included Pastors Jim and Lori Bakker, Bob Weiner, Lt. Gen.(Ret) Jerry Boykin, Steven Strang, Bishop Wellington Boone, Bobby Conner and Rick Eldridge to name a few. Following these round table meetings, MorningStar held its annual Board of Directors meeting explaining where MorningStar Ministry stands now and where its direction is headed. 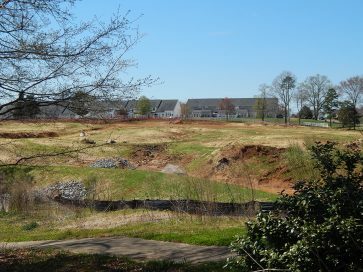 During the month, Ryan Homes continued building the new Glynwood Forest Town Homes over the area that included the Upper Room’s old parking lot and the property where the Amphitheater and Mc Mooses Restaurant once stood. These 120 plus townhomes are on Regent Parkway nestled between the Upper Room and Antioch International Church. On the 5th, The Jim Bakker Show aired the first in a series of programs titled “Restoration Day.” By telling his side of the 1987 PTL Scandal, Pastor Jim revealed some of the worst moments that he and his family suffered. From the evidence that was not presented at his trial, to unsubstantiated personal attacks on himself, Jim Bakker went into details of what happened to him during this time. In his 1996 book I WAS WRONG, Pastor Jim tells “the untold story of his shocking journey from PTL Power to Prison and beyond.” Because of a two hour Documentary that aired on ABC News 20/20 depicting Jim Bakker in a dark light, he presented his side of the story on the Jim Bakker Show. Click on the below link to watch this intense show in which Law Professor James Albert* makes the statement that he does not want to set the record straight rather he wants to set history straight. The show includes moments from previous programs revealing Jim Bakker’s raw emotion over what he lived through. This particular program includes The McKamey’s, Ron Blackwood, Law Professor Jim Albert along with special music from Tammy Sue Bakker. This is a must see show to help people fully understand what actually happened during Jim Bakker’s 1989 trial. 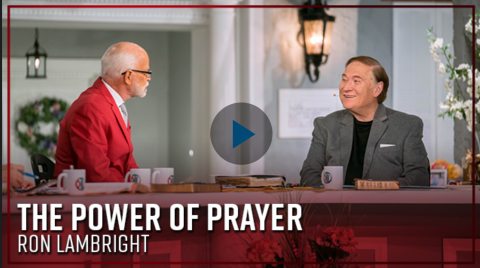 Jim Bakker’s interview with Prof. James Albert begins at the 29-minute mark. 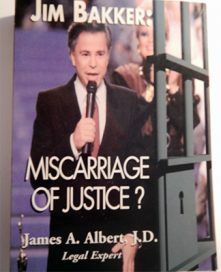 After studying Jim Bakker’s case for several years, Prof. James Albert wrote a book titled Miscarriage of Justice. “Watched in more homes than Johnny Carson’s Tonight Show, Jim Bakker’s PTL Club was the most popular religious TV program of all time. But Bakker’s empire collapsed when he was indicted by a federal grand jury for television fraud. He was found guilty after a tumultuous five-week trial, then sentenced to 45 years in prison by presiding judge “Maximum Bob” Potter. Evidence of intentional fraud on Bakker’s part was weak. Videotapes of past PTL programs that would have helped Bakker’s defense were never seen by the jury. What the jury did hear about were million-dollar salaries, corporate jets, and air-conditioned doghouses. James A. Albert is a law professor, trial lawyer, an expert on broadcast law. Professor James A. Albert has been a Professor of Law for 38 years. He is nationally recognized and has won several awards including being named Professor of the Year eight times at the Drake University Law School. He was named Delta Theta Phi Law Fraternity’s Outstanding Law Professor of the Nation four times. He has written several books, appeared on many national television programs including the “Today Show,” and appeared as himself in a Cinemax movie about one of his clients. Professor Albert has traveled to Belize 14 times to personally oversee the foundation’s scholarship program. He is a 1976 graduate of Notre Dame Law School, the father of twin sons, and the grandfather of 13-year-old twins. On the 11th, United-With-Israel reported: “US Congresswoman Omar tweets new “Anti-Semitic Trope,” slammed by her own party. U.S. Congresswoman Ilhan Omar (D-Minn.) added to her anti-Semitic record on Sunday a little more than a month since being sworn in as a freshman member of Congress. She accused the American Israel Public Affairs Committee (AIPAC), the largest pro-Israel lobbying organization, of paying members of Congress to back Israel. On the 19th, Reuters reported: “France shaken by outbreak of anti-Semitic violence and abuse.” A series of attacks across France in recent days has alarmed politicians and prompted calls for action against what some commentators describe as a new form of anti-Semitism among the far-left and Islamist preachers. On the 20th, United-With-Israel reported: “Palestinians burst into closed Temple Mount area seeking confrontation.” Palestinian factions appear to be looking for a confrontation on the Temple Mount again, barging into an area that was restricted due to illegal activities that permanently threatened Jewish artifacts on the Temple Mount. On the 22nd, Accuweather reported: “Powerful 7.5 magnitude earthquake strikes Ecuador.” A powerful 7.5 magnitude earthquake struck eastern Ecuador during the early morning hours Friday. At least three people have sustained injuries. On the 22nd, Accuweather reported: “Flagstaff, Arizona, sets all-time snow record as major snowstorm burthe ies southwestern US.” A storm is unloading feet of snow, creating blizzard conditions and shutting down travel over the mountains of Arizona and New Mexico. On the 25th, Fox News reported: “’Ice Tsunami’ spawned by windstorms spurs evacuations along Lake Erie, as thousands without power across East.” High winds causing chaos the eastern half of the country with power outages and travel delays have created another problem: a literal wall of ice. 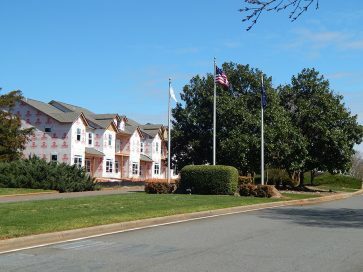 New townhomes being built near old entrance to Heritage USA on the site where Billy Graham’s Childhood Home once stood. 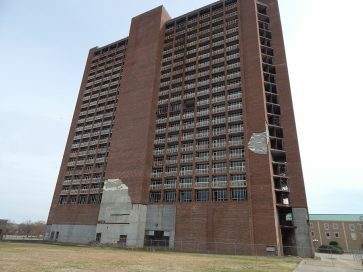 YORK COUNTY, SC – The Supreme Court of South Carolina has decided to hear MorningStar Fellowship Church’s appeals regarding the 21-story tower in Fort Mill, in a decision the church claims as both victory and rebuke. York County attorney Michael Kendree said the order isn’t a decision against the county. The state’s highest court said in a March 11 order it would hear two legal arguments presented by MorningStar, but not a third. A hearing date isn’t listed in the order. 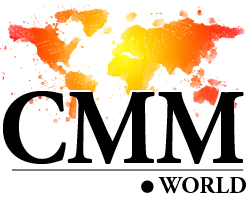 CMM Missions held two conferences this month named Taking Jesus Viral. 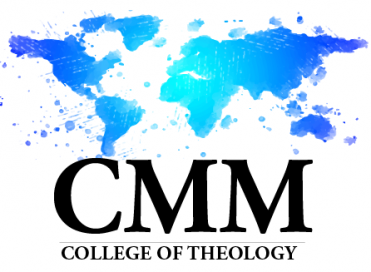 One on March 15th – 16th at their new offices inside Antioch International Church, and one on March 22nd – 24th at Moravian Falls, N.C.
CMM College of Theology: Leaders of CMM College of Theology, Dr. Jorge Parrott and Dr. Nancy Daniel, made the following video congratulating the graduates from one of their outreach schools in India. Upper Room: During the month, Russell James, owner of the Upper Room Chapel, put up the following information on their Facebook page. 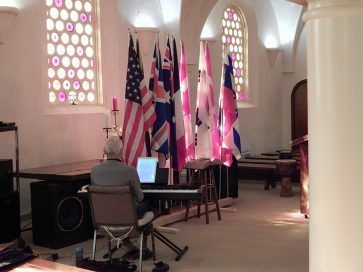 Keeping the Upper Room opened for 24 hours, Russell called people to stop by and pray for all the nations. Antioch International Church, MorningStar Fellowship Church and people from across the nation stood in agreement and prayed for the persecuted churches and Christians worldwide. For more information about the Upper Room check out their website at: www.upperroomchapel.com or facebook page at: https://www.facebook.com/groups/62147692320/. March 19th 1987 marked the 32nd anniversary of the day Pastor Jim Bakker resigned from the PTL Ministry, giving control to Rev. Jerry Falwell with the verbal agreement that Jim Bakker could return to PTL at a later date. “Listen To Me!” we wrote about March 19th 1987 because of the great impact it had on our lives. Here is an excerpt concerning that infamous day as it related to us. Rushing around for the holidays and planning a vacation at the same time caused me to forget about almost everything that year. After a quiet Christmas Day at home, we packed up our car and got on the road. I stayed awake all that night while traveling down deserted highways in the wee hours of the morning worrying and wondering about our future. I was fearful of making a big mistake. After a long trip, we got to Charlie and Celeste’s home in time for breakfast. As soon as we pulled onto their street, we noticed the new house that Celeste had told me about. 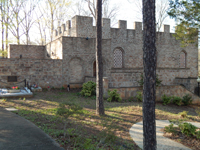 We planned on seeing it, along with calling a real estate agent to show us everything available in the Fort Mill area. We spent most of that week house hunting, while our children were having too good a time at Heritage USA to notice that we were gone. We looked at several homes as well as many building lots within a twenty-mile radius of PTL. Although there were many beautiful homes being built in a few very nice areas on the grounds of Heritage USA, we didn’t want to live there. Throughout the week, Rick and I didn’t see anything in our travels that we liked enough to buy. We then asked Celeste if she could get in touch with her contractor, Mr. Plyler, because he was the builder of the house next door. He promptly dropped off the key, and that afternoon Celeste, Rick, Christine and I went to see it. The house wasn’t finished, but we really liked the layout of the rooms. It was a good size four-bedroom ranch that more than fit our needs. The house itself had details that surpassed our expectations. The extra bonus would be that Ricky and Michael would have their own room, which was important to Michael. Moreover, the price made it possible to buy it free and clear. We all loved the house, and within a few hours we were negotiating with Mr. Plyler. With a handshake, we bought it! He gave us enough time to sell our home, and trusted our word because of his relationship with the Battaglias. The next day, Celeste, Rick and I drove all around town picking out carpeting, lighting fixtures, and countertops. By New Year’s Eve, I was exhausted. Michael was having a little party in our hotel room, along with Michael Battaglia and a few other boys. Ricky was going to have some fun with his friends, while Christine and Rosemarie were going over to Recreation Village to attend a youth concert. Celeste made reservations for us to spend the night at PTL’s annual New Year’s Eve celebration. After a long week of decision making, we were looking forward to having some fun! Thankfully, Michael Battaglia showed us how to avoid the holiday traffic by using the back roads inside of Heritage USA because, from November through January, a few thousand cars lined up for two miles each night to drive through PTL’s spectacular Christmas City. The extraordinary Nativity display was the largest in the nation, and the holiday exhibits and decorations spread throughout the grounds totaled more than two million lights in all. As we slowly drove down the illuminated roadway on our way to the Big Barn Auditorium, it was like driving through a sparkling Christmas wonderland. Cascades of lights were carefully strung to form glistening arrangements of brilliance in every direction that we looked. “Oh to be a part of all this,” I silently contemplated. There were several hundred people gathered inside the Barn, which was appropriately decorated in streamers and balloons. We soon found our table and sat down with two other couples where we all enjoyed the dinner and conversation. Then, over our shoulder, a side door suddenly opened and Jim Bakker, accompanied by his daughter Tammy Sue, came out to greet everyone. I became so nervous thinking they might come over to our table, that I couldn’t move. Celeste was calm about all this, while I hoped they would pass us by. When they stopped at our table, everyone politely said, “Hello.” All I could do was shake Jim Bakker’s hand and tell Tammy Sue how nice she looked. I was relieved after they left. Rick thought my reaction was funny because he had met many important people while working in Manhattan, so none of this phased him. The rest of that evening was fantastic. During the night, we enjoyed listening to some famous gospel artists, including Howard and Vestal Goodman. The entire PTL orchestra and singers were fabulous, and when Tammy Faye and Tammy Sue sang a duet together, you could feel the love of God inside that whole room. We were all very blessed to have been there. Jim Bakker counted down the last few seconds of 1986, and loudly announced the New Year of 1987 declaring, “Victory is our cry!” During the next several minutes, there was just as much hoopla, noisemaking and cheering as was going on at Times Square. Afterward, we all wished each other a Happy New Year and picked up the small candle we were all given earlier. Then Jim Bakker lit his candle and began passing the light from it along to everyone else in the room. From his one candle, everybody around him was able to light his or her own candle and then pass that light along to the rest of us. With the overhead lighting turned down, the glow from the countless little candles flooded the entire room. It was simply beautiful. 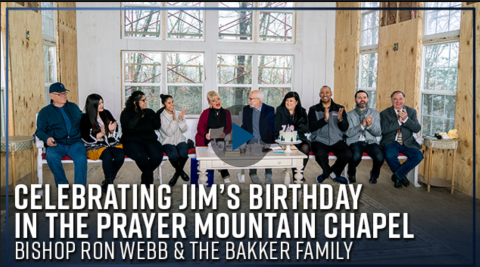 Jim Bakker then thanked the Lord for the success of the PTL Ministry over the past year and prayed that God would continue to bless the ministry’s outreach. As I stood there in silence pondering all of the exciting changes that 1987 was going to bring into our family’s life, I wanted to get a jump start on it all. Despite the treacherous weather we encountered on the way home, our minds were filled with wonderful thoughts of moving to the Carolinas. Our kids even seemed happy over the prospect of moving, and I could hardly wait to tell everyone. The day after we left PTL, Jim and Tammy televised the groundbreaking ceremony for the new location of the Heritage Village Church. After the frigid outdoor ceremony ended, they immediately went away for a few days of rest, but Tammy became deathly ill with pneumonia, resulting in her having to be flown out to California for treatment. A few other problems occurred during this time as well, so they stayed there much longer than they expected. Meanwhile, it was difficult to tell some people the news, especially Mary Ann and Rosalie. Even though I promised Rosalie that I would teach until June 1st in order to finish out most of the school year, it was a bittersweet moment for both of us. By then, our home had more than doubled in value, and I made sure the real estate agents stipulated to any potential buyer that we had commitments in New York until June. After everything was in motion, it became hard for me to face Pastor Nick. He couldn’t understand why we suddenly wanted to move down south, and he naturally wanted to make sure we knew what we were doing. We had more than one discussion about this, but after a while, he tried to understand. Pastor Nick’s main concern was that we wouldn’t have the watchful eye of a pastor looking out for us after we left him. I was a little apprehensive about that fact, yet this was the direction that God was leading us. Amazingly, by mid-February, we had a solid buyer for our home. After a few of the usual negotiation delays, our lawyer phoned us with a date to go to contract. On the morning of March 19th, we drove to his office in the city. Rick and I didn’t encounter one problem going over the paperwork, and it took less than an hour to sign and seal the transaction. Right after we left the city, I started to feel very uneasy. The day was overcast and gray, seeming strangely ominous. For some reason, I wasn’t excited. On the way home I just stared out of our car window thinking, “This was too easy.” It was as if God had whisked us from one thing to another over the past nine months without wasting a minute of time. I was very much aware that nothing this good comes without some kind of spiritual battle. I started thinking about Roseann Grennan’s telephone call from PTL a few weeks earlier saying, “Chris Baumann, all hell breaks loose trying to move down here!” There was a lot of truth to what she said, but we were sliding through everything without any unusual problems. My uneasy feelings were very real; there was a foreboding presence that surrounded me all the way home and I couldn’t ignore it no matter how hard I tried. By suppertime, I was still preoccupied in thought when our phone rang. It was Bob Dietrich calling us from PTL. He was in a very somber mood as he told Rick that he had just come from a prayer service at the Upper Room where Uncle Henry made the unexpected announcement that, “Jim Bakker has resigned.” When Rick relayed this to me, my uneasiness suddenly lifted. It was as if I expected bad news, and now I knew why I felt so deeply troubled. Bob explained to Rick that the reason for the sudden resignation was that Jim Bakker had been involved in a sexual encounter, and it was going to be made public in the morning. After they hung up, Rick and I just looked at each other for a few seconds saying absolutely nothing. Both of us were too numb to talk. He had to leave for a church meeting, and I had to try and calm down and think. At that second, I didn’t know what to believe. Later on that night, Rick came home from church feeling very discouraged. He told me that everyone was shocked by the news and a few of our friends wanted to know if we were still going to move. As hard as it was to understand at that moment, there was no question as to whether or not we were going. But I didn’t sleep very well that night thinking about the morning paper and the impact that this terrible news was going to have on the church world. During the month, Jim Bakker invited Mark Biltz on his show. Mark Biltz, author of the 2014 bestseller book titled “Blood Moons” and pastor of El Shaddai Ministries in Tacoma, Washington (http://www.elshaddaiministries.us/) is the man who linked the four Blood Moons appearing in a two-year cycle to the Jewish Holy days of Passover and the Feast of Tabernacles. Below is a short video from his appearance. 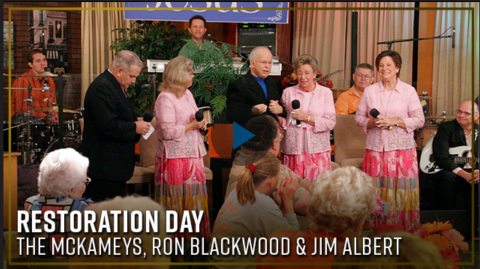 The entire show can be seen in the Video on Demand section of the Jim Bakker Show at www.jimbakkershow.com. Among other guests on the Jim Bakker Show were Derek and Sharon Gilbert talking about modern-day Nehemiahs. The Gilberts are hosts on SkyWatch TV and also host the show “SciFriday” which can be seen on the PTL Television Network. On the 28th, Bishop Ron Lambright, a long time friend of Jim Bakker, was a special guest on the Jim Bakker Show. Bishop Lambright is also the pastor of the Freedom Christian Center and conducts a church service on Sunday mornings in the Upper Room. This faithful servant of God was one of the original pastors in the Upper Room when it first opened in 1982. This revealing program delved into some of PTL’s history concerning the Towers and the Upper Room and explains how the Upper Room came to be built and how God’s hand protected and saved the building from destruction. This is a MUST SEE program which also answers a variety of questions people have had over the years. On the 4th, Fox News reported: “Alabama tornado damage looks like ‘someone took a giant knife and just scraped the ground,’ sheriff says.” Rescuers are scouring through what remains of destroyed homes as part of an intense ground search in southeast Alabama on Monday after a deadly tornado tore through the region, killing at least 23 and leaving a number in the ‘double digits’ of people who are missing. Click link for story, video and pictures. On the 13th, CNN reported: “’Bomb cyclone’ blasts Colorado and leaves hundreds stranded in cars. About 1,100 motorists were stranded in Colorado as a ferocious winter storm- a ‘bomb cyclone’ unleashed hurricane-force winds and blizzard conditions in parts of the central United States. On the 14th, Fox News reported: “Israel launches airstrikes on ‘terror sites in Gaza’ after attack on Tel Aviv, military says.” The Israeli military said early Friday the country has launched airstrikes on “terror sites in Gaza,” hours after rockets were fired on Tel Aviv. “We have just started striking terror sites in Gaza. Details to follow,” the Israel Defense Forces (IDF) tweeted. On the 15th, Fox News reported: “49 killed and dozens, including young children, injured in New Zealand mass shootings targeting mosques.” Three people are in custody — one of whom was charged with murder — after at least one heavily-armed shooter mowed down Muslim worshippers at Friday prayer, massacring 49 people in two New Zealand mosques while broadcasting a horrific live stream of the terror attack. On the 18th, Fox News reported: “Midwest bracing for more ‘unprecedented’ flooding that has shattered record-high river levels.” Residents in Kansas and Missouri were steeling themselves Monday for the deadly and “unprecedented” flooding that’s already saturated large portions of the Midwest, mangling hundreds of homes and raising the Missouri River above record water levels in many areas. On the 25th, Fox News reported: “Trump formally recognizes Israeli control of Golan Heights.” President Donald Trump signed a proclamation on Monday recognizing Israel’s sovereignty over the Golan Heights, reversing more than a half-century of U.S. policy.